In 2016 I was pleased to have the opportunity to re-release “An Angel for St. Clair” and "An Inconvenient Wife". The first two of a three book series, the books are quite independent of each other, but for those interested in what comes 'happily ever after', all are loosely linked by the reappearance of the main characters in the second and third books. (Captain Carlisle's story is high on the 'yet to be written' list.) 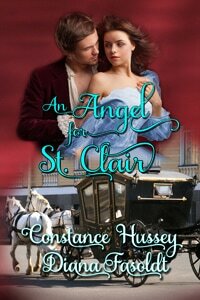 I think you will enjoy reading about St. Clair and his Angel, and Nicholas and his unexpected wife, Anne. Happy reading! Fate brings them together on a perilous mission to France—Love binds them forever. 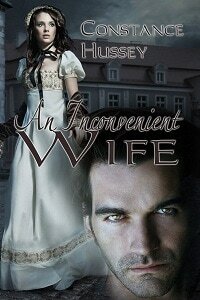 His mission to France doomed to failure unless he finds someone suitable to pose as his wife. Devlin St. Clair is quick to turn his discovery of a barely conscious woman to his advantage. An appealing waif, whose amnesia he considers his good fortune, she is perfect for the role. Haunted by an unknown danger, injured and penniless, Juliette Deveneau agrees to accompany the compelling English lord to France. She needs his protection but she has only his word that he will explore the mystery of her past and that he has no knowledge of her prior to the fateful night that brought them together. Hunted by the traitorous Frenchman who abducted her, the unraveling secrets in Juliette’s past put more than her life at risk. They could tear her from St. Clair’s arms forever. Fate has thrown them together—but only love can turn this staged marriage into something real. An Inconvenient Wife” was reissued in January, 2016, with basically no changes except for some editing to clean-up some typos and tighten the prose a bit. Anne and Nicholas are two of my favorite characters. Their unexpected marriage comes with three children, so not only do they need to find a way to a true union between them; they have the well-being of these youngsters to consider as they take up the task of providing a loving home for them all. Sarah has suffered a crippling injury, French born Guy and Danielle have little English and must adapt to a new culture. A challenge indeed to weld these disparate personalities into a true family! If you wish, please fill out the contact form to receive updates on future publication dates. Thank you.